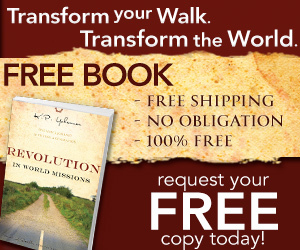 Free Gospel for Asia book sent to your home. I love this organization and their commitment to preach Jesus to those in Asia. Snatching people out of the fires of Hell and into the arms of Jesus. at daybreak I plead my case to You and watch expectantly. I have found great joy in waking up and talking to Jesus. In order to get the day going on the right foot, people will exercise, drink coffee, eat, read the morning paper, or other daybreak rituals. Yet, there is something which goes on deeper when I start off with prayer and reading God’s Word. Giving God the first part of the day, I gain more than a physical jump start for the rest of the day. Thereis a spiritual aspect of realizing God has gone before me and to prepare me to accomplish His will for my life. Making it through the day can only truly accomplished when I thank Jesus for giving me another day to live for him and share with other about him. 12 For our battle is not against flesh and blood, but against the rulers, against the authorities, against the world powers of this darkness, against the spiritual forces of evil in the heavens. I am seeing more and more everytime I make a stand for Christ, I get attacked spirituallly. Yet greater is Jesus living in me than the devil that is in the world. The devil doesnt mess with the quiet christians. He just gets mad and attacks anytime a believer in Jesus uses his spiritual armor for the Lord and empowered by the Lord. So if you dont want to be attacked stay off the battlefield. Yet, God calls us, via the Great Comission, to go into all the world to proclaim the name of Jesus.